What is rich gum syrup? Rich gum syrup is a double strength dark syrup with gum arabic added. It is based on the rich syrup that Dave Wondrich writes about in Imbibe! : From Absinthe Cocktail to Whiskey Smash. You can think of rich syrup as cane syrup like the kind that comes from Martinique. To this rich syrup I have added gum arabic to get some extra viscosity and body. Gum arabic also helps keep the sugar in suspension which can be helpful with a double strength syrup. In the 19th Century syrup routinely had gum arabic (also called gomme) added to it and plain simple syrup was the exception and not the rule. 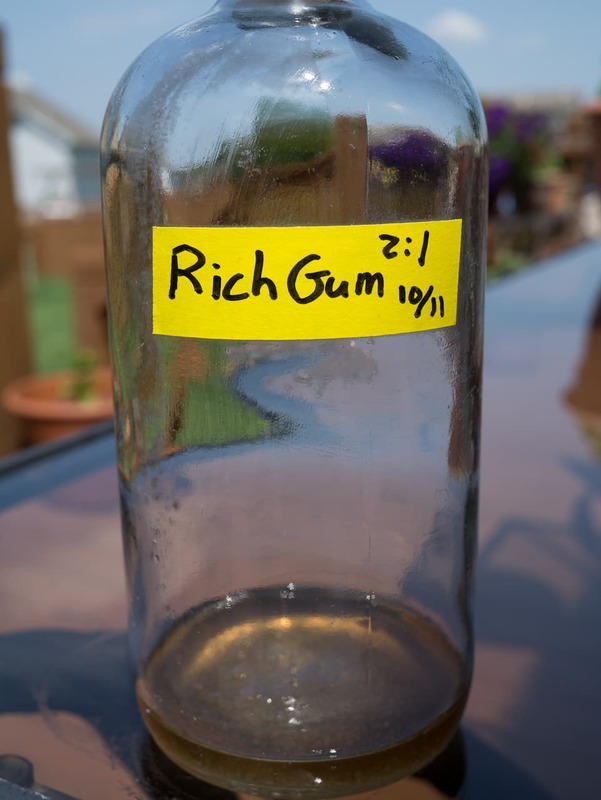 You can use rich gum syrup in place of simple syrup or sugar in almost all cases. Just back off by 1/3 from the amount of simple syrup (1:1 or single strength) specified in the recipe. One other thing to be aware of is that the color of the drink will be affected. But because this rich gum syrup is double sweet, you won't be using that much of it so the affect on color is rather minor. Rich gum syrup is especially suitable for high strength drinks such as Sazeracs, Daiquiris and Old Fashioneds where the gum can lend a velvety texture to the drink. Wondrich specifies double strength in his recipe and I have come to like this strength as you don't have to store as much of it. To help with balancing acids, I recommend about 1 part of rich gum syrup (2:1) to 2 parts lime juice. Increase syrup slightly (like 15%) for lemon juice. As always this is a matter of individual taste. Heat water. Dissolve gum into the water as it heats to dissolve the gum. This can take some time but keep stirring, it will dissolve. Add sugar and stir to dissolve. Simmer for about 2 minutes and then turn off the heat. Skim the stuff on top. Let cool some and then whisk in the 151. This is 6:1 ratio of water to gum (6 oz water by volume to 1 oz gum by weight). This works for this syrup. The syrup has some viscosity from the gum, good mouth feel, not too thick, and the sugar does not crystallize. I store this in the fridge (which is optional) and it's pretty thick but it will pour fine. If using in stirred cocktails you will want to stir energetically, but you should probably be doing that anyway. The Imbibe! recipe was using a 3:1 ratio. This resulted in a super thick syrup that proved to be unusable. If you prefer not to use gum just leave it out. Rich syrup without the gum is still an improvement over plain simple syrup. Also, if you don't want quite to dark a syrup, you can back off on the intensity by using evaporated cane juice or raw sugar instead of Demerara. Turbinado sugar is usually about the same color as Demerara. Makes about 16 oz of syrup. Mine keeps for months. If you make some, let us know how it turns out for you.